At least fourteen people were shot in D.C. over the weekend, and six people died. Police have made one arrest in the cases. Thirty more people have been killed in the District compared to this time last year. 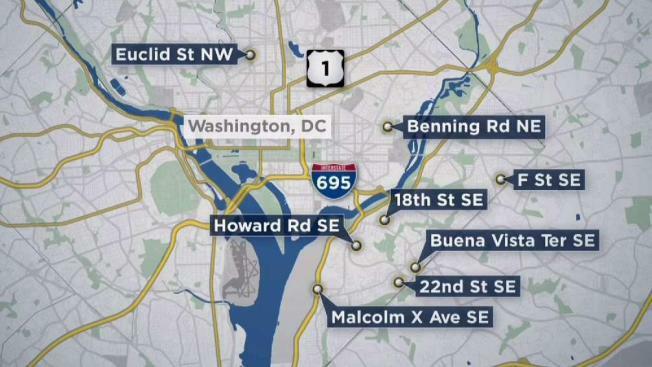 D.C. Police reported that four more shootings occurred Monday. Tune into News4 at 11 for Shomari Stone's live report. Six men died in D.C. since Friday morning in a series of shootings that spanned every quadrant of the city. On Friday morning, 27-year-old Kajuan Deris Young was taken to a hospital after police found him suffering from gunshot wounds in the 900 block of 3rd Street SW. He was pronounced dead at the hospital. Police are working to find five suspects who last Sunday beat two gay men, knocking one of them unconscious, in a possible hate crime. News4's Derrick Ward spoke to the men about their harrowing ordeal. Police responded to another shooting in the 5100 block of F Street SE about 9:41 p.m. that night. Two men had been shot multiple times. Terrell Butler was taken to the hospital, where he died. He was 41. The second man was treated for non-life threatening injuries. Two more men were shot about 2:15 a.m. Saturday in the 1600 block of Euclid Street NW. Southeast resident James Thomas Dunn was taken to the hospital but died. He was 37. The other victim was treated for injuries that were not life-threatening. At 12:17 a.m. Sunday, Seventh District police officers responded to the sound of gunshots in the 3100 block of Buena Vista Terrace SE. Police found a man suffering multiple gunshot wounds who showed no signs consistent with life. The victim, Juan Dwayne Jackson, of Oxon Hill, Maryland, was 45 years old. Police said a second man sought treatment at a hospital in the same shooting. Officers from the same district responded to another fatal shooting in the 1400 block of Howard Road SE less than an hour later. They discovered the victim, Ervin Eugene Watkins, was being treated at a hospital. The 28-year-old later died. Seventh District officers responded to a third shooting that night about 4:15 a.m., this one in the 3400 block of 22nd Street SE. They found a man unconscious and not breathing. William Hayworth, 42, of D.C., died and was taken to the medical examiner's office. "My father was a hardworking man," his son told News4. He asked not to be identified by name. "I already miss him." D.C. police reported at least seven other people were injured across the District in shootings between Friday and Sunday. In one incident, three men and a woman were struck in one outbreak of gunfire. The violence wasn't limited to the city; a man was killed at a 7-Eleven in Silver Spring, Maryland, after a dispute with a security guard. Police Chief Peter Newsham said the shootings don't appear to be connected. No arrests have been made in the homicide cases. But the weekend violence continues a disturbing trend in the District: Police data shows that homicides are up. By Sept. 23, 2017, 80 people were killed in the city. Since January this year, 110 people have been killed. Both years, roughly seven of every 10 people killed in D.C. were attacked with a gun. A neighborhood safety walk will be held in Northeast D.C. on Monday night, beginning at 7 p.m. at 19th and L streets NE. Neighbors, police and city officials are expected to participate.